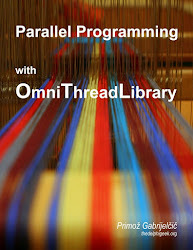 Multithreaded programming is a pain in the <insert body part>. Whatever you do, sooner or later your code will stop working correctly. Service writing is not simple, either. There are many limitations that should be taken into account (lack of graphical user interface, for example). For quite some time now, I was sure I mastered them both, but not so long ago a service/thread combination proved me wrong. There's a catch in service programming that I was not aware of until I had to spend several days tracing down one rarely occurring problem. It was so rare that it happened only at one customer and even there the application crashed only once in several hours. So what's the catch? It is quite simple. Every Windows service is multithreaded. Even if you don't create threads in the service application, it will be using two threads. It gets even worse. On the service form, OnCreate and OnDestroy are called from the main application thread while OnStart and OnStop are called from the main service thread. There is a logic behind this, and it is quite obvious once you stop to think about it. A service application can contain several servicesand as they are independent entities, each must run in a separate thread. On the other hand, OnCreate/OnDestroy are called from the main application which creates those services, and are therefore called from the main application thread. Simple. But it can bite you. If you drop some components on the service form, they will be created in destroyed from the main application thread. Of course, they will be used from the appropriate service thread (or from the service thread, if there's only one service in the application, which is usually the case). Usually, you won't notice this. But things start getting weird if component in question creates hidden message-processing window. Main application thread will process messages for this hidden window, but you'll usually want to process them in the service thread. Even worse, if you implement some kind of message pump in the service thread, two threads will be processing messages for the same component. It won't happen frequently, but it surely will happen and you can imagine the result. Deadlocks. Data corruption. Mayhem. Yes, that's what happened to me. BTW, that's also why TTimer doesn't work correctly if you drop it on the service form. What happened here? First OnCreate/OnDestroy got called (when ServiceDemo /install was run). Next, OnCreate was called from thread 3184, OnStart/OnStop were called from thread 4588 (I told you!) and OnDestroy was called from thread 3184. Finally OnCreate/OnDestroy were called then ServiceDemo was run with /uninstall switch. So there's another problem with dropping components on the service form - they will also be created/destroy whenever service application is called with /install or /uninstall switch! The moral for today: Dont drop anything on the service form. Ever! Today I found the Delphi Wiki. Not very full - yet - but still contains some useful info. It is waiting for your additions at http://delphi.wikia.com/wiki/Main_Page. And it is a very interesting coverage on extending live templates. Updated on 2006-07-17: I just found a wonderful Delphi blog aggregator: DelphiFeeds.com. Recommended!